15 minutes before your arrival at terminal T4 of Madrid Barajas Airport, call the telephone number that you will find in the email confirming your reservation. 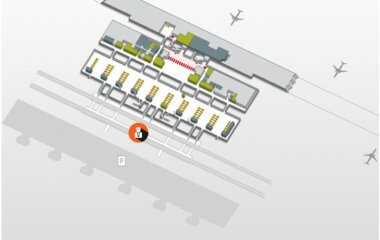 The pick-up of your vehicle will take place in terminal T4, in the Exits area in front of Gate 6, as indicated in the diagram of T4. The teleoperator will coordinate with your driver the delivery of the vehicle. The driver will be waiting for you in the departure terminal platform.